Lima beans are popular in the Southern states, and you'll find them in many classic dishes. They're served as a side dish or main dish on their own or as a succotash blend of vegetables. They're also great in a hearty soup or stew. 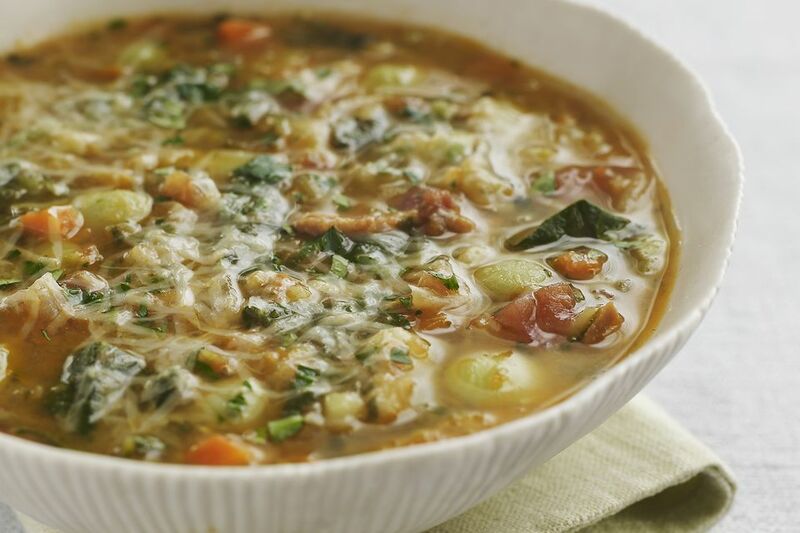 This lima bean soup includes ham, vegetables, and complementary seasonings. Frozen baby lima beans are the best choice for this soup, but cooked dried baby lima beans are a good option as well. See the instructions for cooking dried baby lima beans. Along with the diced carrots, consider adding 1/2 cup of diced celery for extra flavor. Diced rutabaga makes a nice addition as well, or add some fresh or frozen corn kernels. Feel free to replace the ham with leftover corned beef or some diced smoked sausage. Or make it with the addition of about 1/2 cup of diced cooked bacon. The recipe calls for 2 teaspoons of dried marjoram. Marjoram is similar to oregano but milder. If you are substituting with dried oregano, use only 1 teaspoon. Or replace the marjoram with about 1 1/2 teaspoons of dried leaf thyme. Melt the butter in a Dutch oven or heavy stockpot over medium heat. When the butter is hot, and the foaming has subsided, add the onions and carrots. Saute the onion and carrots for about 5 to 7 minutes, or until the onions are soft and just begin to brown, stirring frequently. Add garlic powder or fresh garlic, herb seasoning, and lemon juice. Continue cooking for 2 minutes. Add the ham, frozen lima beans, marjoram, parsley, and stock or water. Bring ham and lima bean soup to a boil; reduce heat, cover, and simmer 20 minutes, stirring occasionally. Taste the soup and season with salt and freshly ground black pepper, as needed. Serve ham and lima bean soup with homemade cornbread, if desired. For uncooked baby lima beans, rinse about 1/2 pound of lima beans and pick them over, removing malformed and damaged beans. Put the beans in a stockpot and cover with about 4 cups of water. Cover and let stand for about 6 to 8 hours or overnight. Drain the beans and cover with 4 cups of fresh water. Bring to a boil; reduce the heat to low and simmer for about 45 minutes to an hour, or until tender. Drain and use in the soup.